Over at Less is More they are celebrating their 6th Birthday-congrats and love the new look. I made this card for thier latest challenge-to use 3 adjacent colours on the colour wheel. I used yellow, orange and red. A bit dull here in London-so I apologise for all those shadows! The solid section of the butterfly is die cut from a brusho sheet where I mixed yellow and orange. I spent some time the other day making up brusho sheets I could use for die cutting. A lot of fun doing this and have some fab colour mixes to use. The top part of the butterfly is red vellum. Just added a few gems and sequins to finish the card. Gorgeous card! Love the vibrant colours against the white panel! Your eye catcher - I love them!! This is beautiful. I love your layered butterfly. 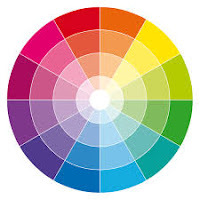 Your bold colors are super pretty. Love this CAS card! Thanks for sharing at Less is More! Love this...we need the bright, vibrant colors this time of year! Beautiful butterfly....love the sweet colors. 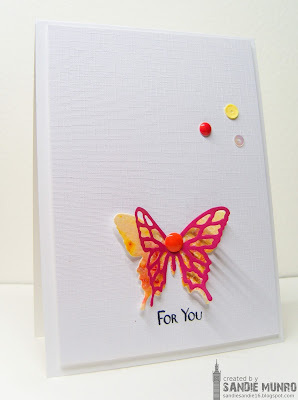 Gorgeous card with this beautiful butterfly. So much fun to play and make those backgrounds. Your butterfly is soooooooo beautiful, Sandie and your card has a wonderful CAS look!!!! Lovely, my friend!!!! Fabulous, Sandie. I really must have some play time with my brushos again soon. Love that snippet paired with the vellum. WOW ! Absolutely gorgeous CAS card Sandie ! I love the solid section of your butterfly made with Brushos ! I ordered some and I'm waiting for them, so curious to try ! Thanks for sharing and for inspiring. I'm a bit disappointed that I'll have no time to enter this challenge. I've come to enjoy color challenges and CAS but I can't say ideas pop up in my mind like a flash for those, lol. As usual, your design looks effortless and just tada, gorgeously ultra CAS:) love the vibrant colors. Nonni and Sandie's First kit!